Sixteen-year old Jack O’Brien has never known the bittersweet stint of love, and romance is the farthest thing from his mind as he and his family arrives at a remote U.S. Air Force outpost in Japan where Jack’s father is base commander. The year is 1948. 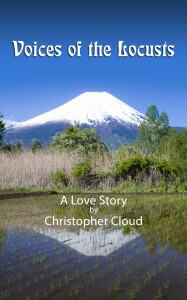 Jack’s life changes after a chance encounter with Fujiko Kobaysi, a beautiful and enchanting 17-year-old Japanese girl. Jack is immediately smitten. Fujiko’s traditional parents are overly protective and monitor her every move, and Jack and Fujiko meet secretly at her garden, located some distance from her village. There is a good reason why Fujiko’s parents are so protective and Jack is devastated when Fujiko tells him that her parents have promised her in marriage to an older man, a practice common throughout Asia at the time. The marriage is only a months away. Jack devises a cunning plan, one that will overshadow her arranged marriage and bring Fujiko and him together. Playing against a backdrop of swirling post-War social change, Voices of the Locusts tells the story of three families – one black, one white, one Asian. Told in Jack’s voice in vivid and sometimes haunting detail, Jack and Fujiko are frustrated in their romantic quest by story characters coming to terms (often violently) with the emotional scars of World War II. PURCHASE FROM AMAZON: PAPERBACK OR KINDLE VERSION! Christopher Cloud began writing fiction full time after a long career in journalism and public relations. Voices of the Locusts is his fourth novel. A multi-genre author, Chris Cloud’s choice of novels to write is determined not by genre, but by the weight of the story. Cloud graduated from the University of Missouri in 1967 with a degree in journalism. 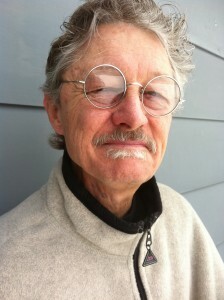 He has worked as a reporter, editor, and columnist at newspapers in Texas, California, and Missouri. He was employed by a Fortune 100 company as a public relations executive, and later operated his own public relations agency. Cloud attended high school in Japan, and much of his Voices of the Locusts is based on personal experience. Cloud lives in Joplin, Missouri.